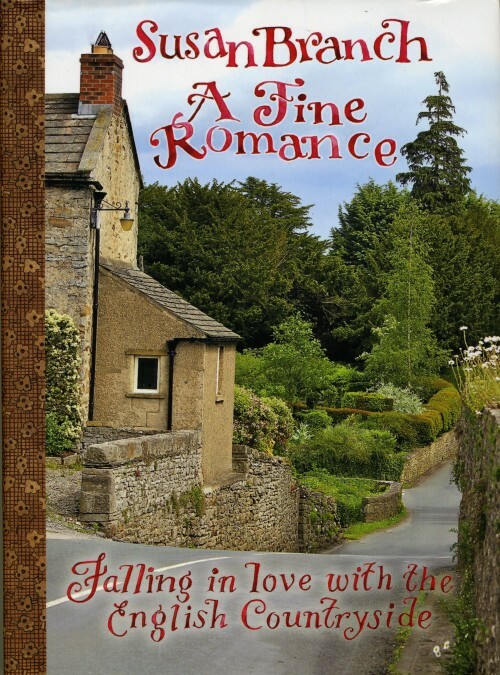 Discover the charm of the English countryside with Susan Branch in her new book: A Fine Romance-Falling in Love With The English Countryside. I love, love LOVED this book. 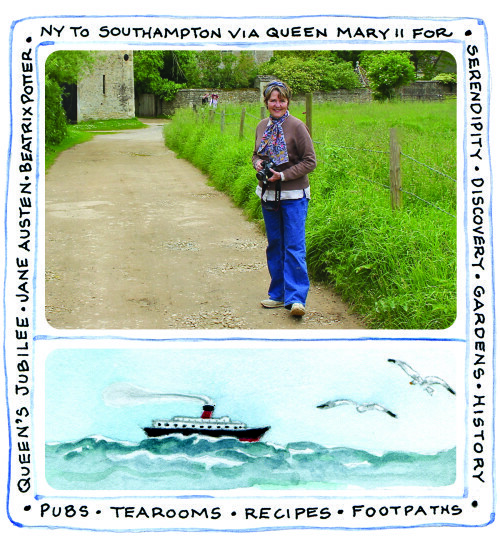 In her book Susan shares how she and her husband met and fell in love and how they shared a dream of taking a voyage to England on an ocean liner. Their dream came true in 2004 and again in 2012 for their 25th wedding anniversary. She shares their adventures from their most recent trip to England. They spent 2 months exploring the English countryside visiting quaint villages, gardens, castles, manor houses, tea shops and more. Susan shares interesting details about the places they visited, English culture and recipes she gathered. Her book is a feast for your eyes with lots of photos and her delightful watercolor illustrations. It even has a red ribbon bookmark! 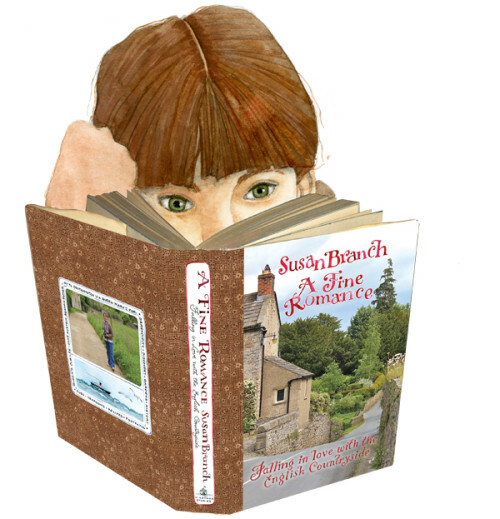 In true Susan Branch style almost every page has a quote that adds to the charm of the book. She includes a list of inspiring movies to watch before a trip to England (or any time), books that will make your trip to England even better and ideas for music to go with the scenery of England. A few years ago we visited many of the same places in England that Susan and her husband explored including Lacock Village. We even took a photo of the same rose covered door that she did in Lacock village. (Her photo is on page 227 in her book in the left hand corner.) 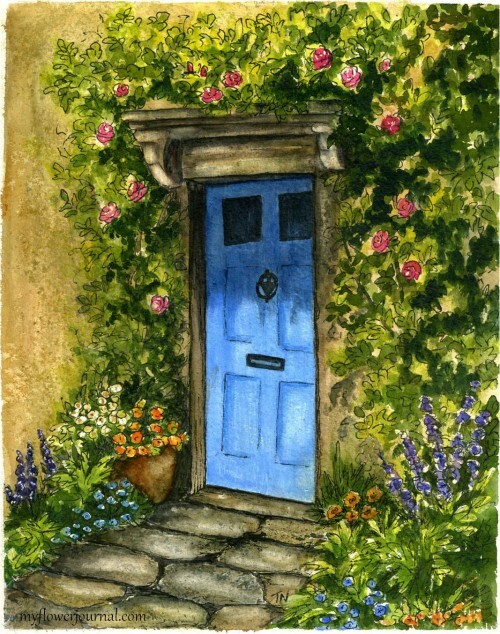 This is the watercolor I did inspired by our photo, but I painted the door blue and added more flowers. Sounds like a great book-I love reading travel stories and have read many about France, a few about Italy. Your watercolor is positively gorgeous!!! That stone walkway is amazing! I ordered her book from her before it was even published. I have followed her for many years. Her art is so enjoyable to look at, and inspiring as well. How wonderful that you have discovered her art, and sharing it with your followers! I will defiinitely put this on my “to read” list. Thanks Tammy! I, too, pre-ordered the book from Susan and devoured every word and picture! I want to read it again! Susan outdid herself on this charmer. Oh my goodness, I love Susan Branch and I love the English countryside. I’m so happy to learn about this book! The book looks wonderful! I have enjoyed Susan Branch art work in note card form and recipe books for years! Was surprised to note the cover on the book is not one of Susan’s wonderful watercolors! PS I am in Utah too… where in Utah are you? I’m pretty sure I took a picture of that door myself…Loved Lacock, loved England. sigh…would love to go back someday. Sounds like a great read. Thanks for mentioning it – I’ll add it to my list. What great watercolor. Nice photo. Love that door. Thanks. Sweet to learn of Susan’s book. Your door and roses are stunningly beautiful and inviting as well! HPPF! I’m ordering the book! And your watercolor is lovely! I love your blue door picture, so beautiful and peaceful, the English countryside is so lovely! Adorable work!Happy PPF and hugs from Brazil! Loved your painting and the book sounds wonderful. Brings me back to my trip to the Cotswolds. Such a lovely place. Your painting is gorgeous! I love the blue door! lovely painting within your flower journal pages~! I love your painting of the blue door surrounded by flowers. I just received the copy I ordered a couple of days ago. Hope to get to read a little more over the holiday weekend. Going to the book signing with my friend in Grand Rapids Michigan next weekend. Your painting is lovely. That book sounds like a wonderful way to travel from home. I love your sketch of the doorway – just want to turn the knob and go in. That watercolor painting is gorgeous! And the book sounds like a great one. I’ll be taking a trip to England soon, so I might have to find this. Thanks! Your watercolor is gorgeous! We drove by Susan’s house on Martha’s Vineyard this summer, and was hoping to see her out walking on Main Street. I love her style! I am a huge fan of Susan Branch and will be buying her book! One of my dreams is to go to the English Countryside but first Alaska next year! The book sounds like something I would really enjoy reading. Two of my good friends have visited the English countryside many times and loved it. They stayed at little B&B’s along the way. My favorite by far is the watercolor you did with the blue door! You are a fine artist! Love Love Love your watercolor of the English door! I recently drew one in pen and ink…haven’t been working with color for awhile, but you inspire me. :) Thanks for the tip on the book. Haven’t been there yet, but I’ve always loved all things English. I’m so sad I can’t get this book before we leave for England this coming Thursday. I wanted to read it on the plane on the way. I’ll order it on Amazon and enjoy it when we get back. None of the stores have it in stock around here. We are going to stop in Lacock Village amongst other places. I’ll have to put your blog on my feedly! The blue door in lovely painting really zings amid the gorgeous flowers, and as an English woman I can testify to it’s really feeling of Englishness. It sounds an interesting book. Another lovely (but slim – 75 pages) book you might like is ‘England is a Garden – a wayfarer’s companion’ by Catherine Hamilton, ISBN 0 86288 550 7. Beautiful, delicate pencil sketches of the places she visited together with full page colour sketches of the flowers she saw on her travels around England. Last words in the book: ‘Our England is a garden that is full of stately views, Of borders, beds and shrubberies and lawns and avenues ….’ Rudyard Kipling.